1. Cover a particular eater – You may want to do a story about a particular competitive eater if there is one in your community. To find eaters in your area, use our Find An Eater application and make sure to use major cities when searching. You will then be able to contact that person through their email address that is listed, or through their social media that is posted on their profile. You may even choose to join the community (you must start the registration process on the homepage) so that you can message the eater that you are wanting to do a story about. Please list yourself as a Promoter. The eater will be happy to answer any and all of your questions. 2. Cover a particular restaurant with a challenge or contest – You may choose to do a story about a restaurant that just happens to have a food challenge. To find restaurants with food challenges around you, please use our Map Search or List Search application. On the particular restaurant’s challenge page, you will find all of the specific details that you can include in that part of the story. Readers will definitely find it interesting!! 3. Cover a particular food challenge – You may choose to cover a particular food challenge in your community that is totally outrageous. To see your list of options, use our Map Search or List Search application. You will find all of the eating challenge details that you need along with how to contact the particular restaurant. 4. Cover a particular eating contest – You may choose to cover an eating contest that you are contacted about by the particular restaurant hosting the event or their PR company. You can do a story beforehand to advertise the challenge, or you can do a story afterwards covering the contest along with announcing the results. 5. Cover multiple challenges within your city – I have seen many articles like this, where a writer decides to cover many different eating challenges around the community so that interested readers can find out about them all. This would be awesome, and big eaters that follow your posts would love and appreciate it!! This type of story typically gets more attention because multiple parties are involved, which is exactly what you want. 6. Involve yourself with the story – Many stories have been done where the writer actually participated in the eating challenge or contest, and then wrote about the experience. If you choose to do this, make sure to check out the articles listed in our TIPS and STRATEGIES sections so that you can prepare properly. You may choose to do the challenge by yourself, with your own friends, or with an experienced local competitive eater. To find competitive eaters near you, please use the Find An Eater application. This type of story typically gets great reviews because most normal people are more able to relate to the eating experience level of the writer. 7. Involve FoodChallenges.com In Your Story – You are always welcome to reference FoodChallenges.com or any of our particular articles in your story or post. By doing this, you are giving your readers or viewers a place to continue on and explore further, which they will definitely appreciate. If you need quotes or help with anything in particular, all you have to do is contact us, and we will be happy to get back to you as quickly as possible. We appreciate all publicity and exposure. We will definitely make sure to share the story of course too with all of our social media followers. This is obviously a great way to help expand our eating community and fanbase. 8. Cover competitive eating and food challenges in general – Most story ideas are covered above, but this point is just to stress the fact that any type of competitive eating coverage is great for our sport, and is very much appreciated. Even negative articles can be turned into a positive if you know how to spin it right. Make sure to tweet @foodchallenges whenever you post the article or video so that we find out about it. Feel free to hashtag #FeedTheMovement too which is another way for us to find out about it. Whether we are in the story or not, we will definitely share it on all of our social media so that our competitive eating community can all see it too, and we will of course make sure to mention you in the posts. We are going to become the #1 place for people to go and get competitive eating related news and updates, and we appreciate you helping us. If you need anything from us or if there is something we can help with, contact us and let us know what you need for your story. 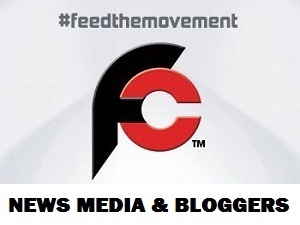 Thanks for reading “How News Media And Bloggers Can #FeedTheMovement” and using our website! !